The event takes place in the showroom building on the Romania lot. 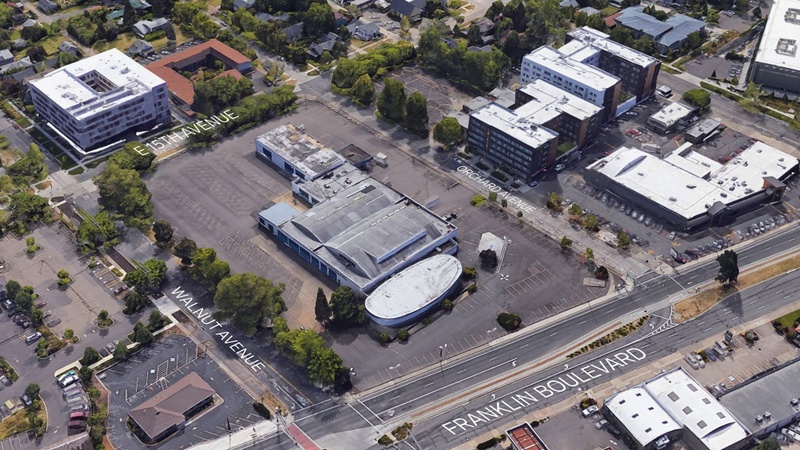 Staff from Portland-based developer Project^ will answer questions, display draft renderings and make a brief presentation at 5 p.m. on how a lease agreement between the UO and a developer could change the former Romania site, which is owned by the UO. The proposed redevelopment, which Project^ is calling University Village, would include a renovated display pavilion, ground-level retail shops, a hotel and restaurant, office space, apartments and townhouse-style homes, a parking structure, and green space for gathering and events. The UO has been exploring a possible long-term ground lease agreement for the property that would provide annual revenue to the university with the developer assuming project costs and operations. A new idea at the UO, the model is used successfully elsewhere in the U.S. to enhance campus-area amenities and generate revenue from university real estate without having the institutions in the development business. The UO and Project^ have not finalized an agreement, but the developer is doing preliminary planning if the project moves forward. Construction could start as early as later this year, with an opening as early as 2021. The Romania site is listed in the National Register of Historic Places by virtue of the distinctive Googie architectural style of the 1960 display pavilion. Project^’s tentative plans would preserve the futuristic spirit of the pavilion but would remove the lot’s warehouse buildings to accommodate the new structures and green space. Matt Roberts, the UO senior director for community relations, can answer questions about the open house or the proposed project at 541-346-2125; mroberts@uoregon.edu.